Select Transformations from the top menu. Click on Create a new transformation... in the top right corner. Expand the advanced options by clicking on More options.... 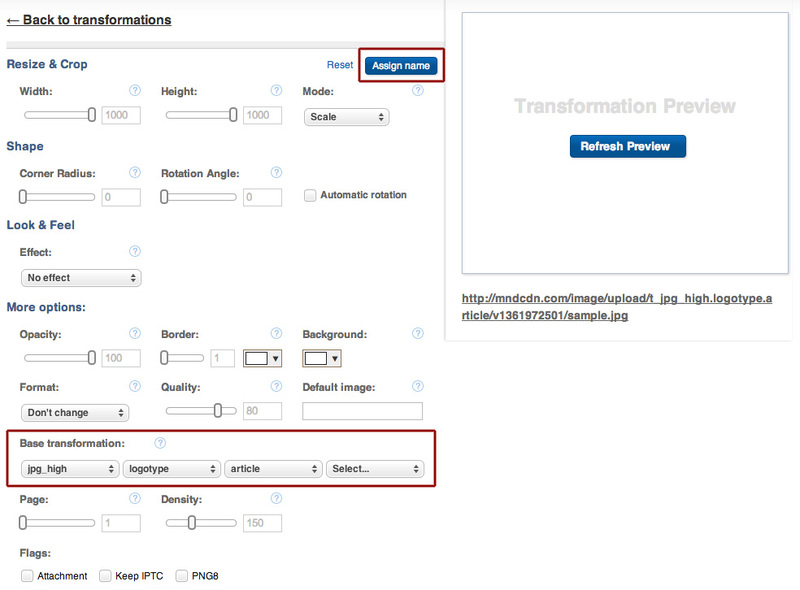 Under the Base transformation section, select one or more base transformations (selecting one transformation will show another select box). Then you can click on the Assign name to name your new transformation. See screenshot for example. How to apply a transformation on multiple images? Thanks for your explanation. could you please how to do named transformation in C#? I don't see "Assign name" on my screen when I follow these steps. Can you please let me know why that might be the case? Is this article just outdated? The button changed from "Assign name" to "Save as". Then, you can pick a name for the newly generated named transformation.